Keep calm and press on! That is usually fair advice for any given situation. This easy-to-make prosciutto panini from our Specialist Chef Marjorie Meek-Bradley offers undeniable comfort and may evoke memories from your childhood. The great thing about a grilled prosciutto sandwich is that you don’t need a particular reason or season to enjoy it. It offers a reward any time of year. You are sure to adore the subtle tang of Taleggio cheese, sweetness of Prosciutto di Parma and the zest of assorted spices in one. If Panini sandwich alongside with sliced apples or a cup of tomato soup! Take a look below for a quick grilled cheese how-to video by Lucie Fink. To make the relish, heat oil in a large skillet over medium-high heat. Add red peppers, cook, stirring constantly, 2 minutes. Add onions and garlic. Cook, stirring frequently, about 5 minutes until softened. In a small bowl stir vinegar and sugar until sugar is dissolved. Add to red pepper mixture along with mustard, cayenne and salt. Cook, about 6 minutes, stirring constantly, until all liquid has evaporated. Remove from heat. Let cool to room temperature. 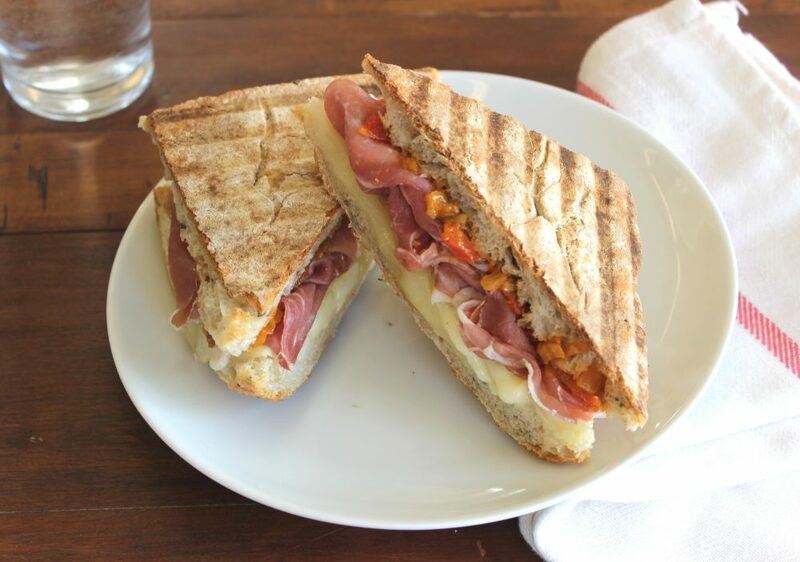 To prepare the sandwiches, layer four slices of focaccia with the cheese and prosciutto. Spread remaining four slices with a tablespoon or two of relish and place on top of the prosciutto to make sandwiches. Cook in a panini maker.